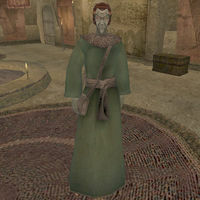 Saras Orelu is a Dunmer healer who works at the Temple in Molag Mar (though oddly enough, he is not a member of the Temple faction). He sells potions and spells there to all who need them. Negative numbers indicate restocking items. This page was last modified on 23 November 2018, at 07:26.